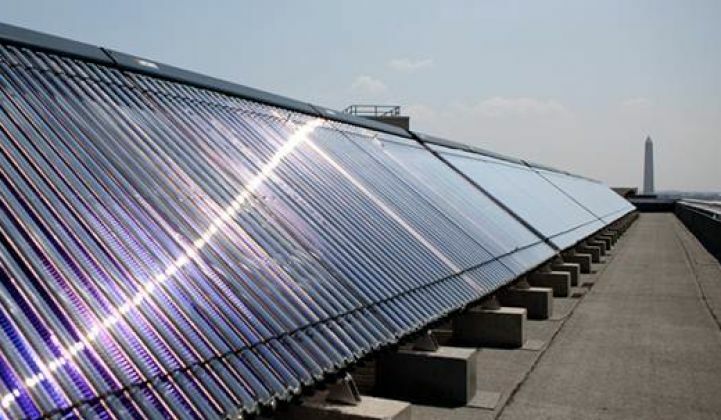 Skyline Innovations, the first U.S. company to offer third-party financing for solar hot water systems, is moving into a different line of business: energy brokerage. Earlier this month, the company changed its name to Nextility and announced that it would be offering energy management services to small businesses. It also closed a Series-B round worth $7 million from existing investors to execute the shift. At first, the transition might seem like a sign that the struggling solar hot water market isn't the right place to build a strong business. But Zachary Axelrod, Nextility's CEO, insisted that brokerage services were part of the plan all along. "When I started this five years ago, the goal was to be a small commercial ESCO," said Axelrod. "We had a business model looking for a home. So we started developing our software for solar hot water." That software is an automated tracking service for utility bills, which the company uses to calculate savings for solar hot water customers. Before becoming Nextility, Skyline Innovations developed dozens of commercial-scale solar hot water systems and closed a $30 million fund from WGL Holdings to support projects around the country. With 45 employees, Skyline became the largest solar hot water provider in the U.S. -- a notable achievement, but also proof of how small the solar thermal market is compared to solar PV. Third-party solar hot water services will still be a focus for the newly rebranded company. But in order to grow faster, Nextility has added more functionality to support gas and electricity brokerage services for customers in competitive markets. "If you're already downloading bills and manipulating them by locking in prices, you can add competitive-rate scenarios," said Axelrod. "The software is the underpinning of our whole business." Nextility's software automatically downloads utility bills, pulls the monthly numbers, compares them to other market rates and rebuilds a utility bill by factoring in new services. Although brokerage services will offer Nextility a new opportunity to expand, the company isn't exactly targeting an area brimming with easy business. Axelrod calls the small commercial sector "insanely hard" to break into due to poor customer education, wildly different usage patterns and small returns for each transaction. He said the company's software enables quick turnaround for "lots of small deals." There are thousands of brokers around the country helping businesses procure energy services in open markets. However, most of them target large commercial buildings, where scale is easier to achieve and the cost of doing business is lower. Nextility's sweet spot will be buildings between 5,000 and 50,000 square feet -- the restaurants, laundromats and convenience stores that very few brokers want to touch. Before founding Skyline Innovations, Axelrod worked at GridPoint, which is now selling energy automation services to small commercial customers. Nextility is taking the opposite approach: rather than selling hardware and energy analytics to facility managers, it's selling energy savings by taking over energy purchasing decisions. "Our belief is that the vast majority of customers don't care at all about this stuff -- so having a menu or even comparisons leads to lower participation," said Axelrod. "We do the comparison for them; they aren't given a menu." In the coming months, Nextility will release a free online monitoring service that allows customers to track their savings and options in a more transparent way. For now, however, the customer simply gets an email outlining a new billing structure. Over time, Nextility may blend the contractor side of the business with the brokerage side and offer lighting or HVAC upgrades, as well as additional solar services. "I don't know what comes next, but we can imagine having multiple lines of business," said Axelrod.